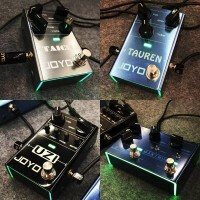 The JOYO American sound guitar effect pedals is one of the UKs most popular Amp simulators from the JOYO first series of pedals. The pedal is designed to introduce the right kind of overdrive, just like an alnico 12-inch speaker pushed to the limits, adding more natural distortion to an already saturated tube. The sound you hear on the 60's surf classics, as well as the country and rockabilly hits from the 50's is the classic fender clean sound. This warm sound which first emerged in 1953. Some describe the tone of the amp as dark, as there is less high end, but it features a full 3-band EQ in case that's really not what you're looking for. This pedal will also do the classic sounds of the early Fender Amps cranked right up, that brilliant growling, saturated overdriven tweed sound. This sound can be heard on countless recordings, from Eric Clapton through to Billy Gibbons. 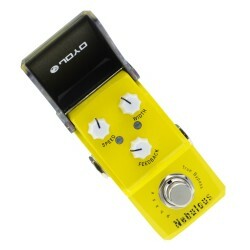 Perhaps the greatest feature of this pedal is the fact that it has inbuilt cabinet emulation meaning you can go from the pedal directly to a mixing desk, a DAW or directly to your computer/laptop with a jack to usb lead. So this pedal is essentially a DI. 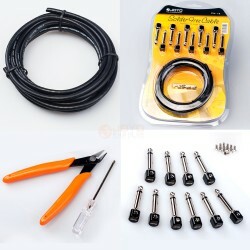 You can use it instead of an amp and it can save your gig if your amp fails, just put it at the end of all your other pedals and set it clean like your amp then just take the output from the American sound straight to the desk. Gig saved. Or by going direct into a DAW or even your laptop you can record direct from the pedal. This JOYO pedal has the smooth, subtle overdrive everyone expects from fender-style tube amps near full volume. When used as a clean boost you get more liquid / sonic gold. Compression and fatness that you usually don't hear from a pedal. True-bypass wiring leaves the tone unaffected when the pedal is switched off, while quality pots, jacks and components ensure that the sound it equally as impressive when you get going. Here's Shane from In the Blues with a lovely demo recording directly into a Zoom recorder and shows you how its done..
1x American Sound Effect Pedal. Close your eyes and feel the JOYO ! 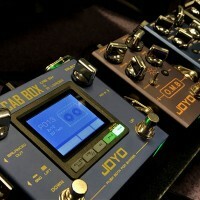 Shane from In the Blues demos the JOYO American and says 'This is the Joyo American Sound Amplifier Emulation Pedal. It is basically a Tech-21 Blonde Clone which is modelled from the Black-Face amplifiers which include the Deluxe Reverb all the way through to Tweed Fender amps. This demo of the Joyo American Sound pedal has the pedal plugged directly into my computer interface/sound card so there's no other amp being mic'd up. This is an amplifier emulation pedal so the idea is, you can use this to record with instead of a microphone and a Fender amp. This makes it perfect for recording or live shows as a backup "amp".' Check his You Tube channel for more pedal wisdom! Amazing Fender-type amp sound with a mild warm distortion/overdrive and perfect for recording without an amp, running your guitar into a computer for direct recording. 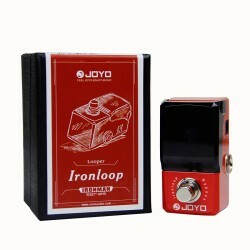 Product InformationJOYO JDI-01 is a modern and efficient DI box from JOYO Audio. It features the b..
A great pedal with a brilliantly cutting tone and heaps of volume on tap, perfect for rhythm & s..
"This distortion has a sound you would be hard pushed to match in a peddle twice the.. 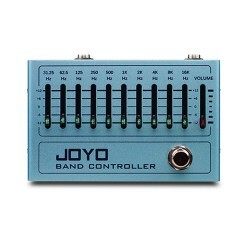 The British Sound from JOYO gives you masses of versatility in one pedal. You can go from early 60's..
JOYO JF-39 pedal nails the crunch distortion sound, presenting the same effect as modern high-gain a..
JOYO JF-319 Green Legend Overdrive packs the classic TS circuit in a very small pedal.We packed a ..